Find out which carrier gets the most cheers -- and which the most jeers -- from our 2016 survey respondents. That thing you carry in your pocket may be called a smartphone, but its main purpose isn’t to talk to other people — it’s a tiny computer you use to connect to the internet, get information and find and use apps. So, for the fourth year in a row we’ve gone on a mission to find out which mobile service provider gives you the most comprehensive and reliable data network coverage, the fastest upload and download speeds, and the most bang for the buck. To do it, we turned to the experts — you and other Computerworld readers. We conducted an 8-week-long online survey this summer asking smartphone users to rate providers in multiple categories: average upload speeds, average download speeds, availability of connection, reliability of connection, performance relative to cost, technical support, selection of phone models, customer service/billing and more. Survey-takers had five choices for each category: very satisfied, satisfied, neither satisfied nor dissatisfied, dissatisfied and very dissatisfied. We crunched the numbers from our 485 U.S. respondents and came up with the winners and the losers. We asked a lot of other questions as well, such as what activities people use mobile data networks for, how much they pay for their service, if they've unlocked their phones, whether they use their provider’s free video-streaming service, why they chose their mobile provider, if they believe their carrier protects their private data, and more. Armed with that information, we've put together a comprehensive snapshot of mobile data use and satisfaction. We found, for instance, that even though the world is moving to no-contract plans and it’s easier than ever to move between carriers, few people bother to switch. In addition, for the second year in a row, despite phone-unlocking rules, few people actually unlocked their phones. We found plenty of surprises as well. So, read on for more — or click here to skip ahead and see which is the best mobile data provider, which the worst, and how the others fared. Editor's note: For the sake of readability, in the story text that follows we've combined the "very satisfied" and "satisfied" responses into a single "satisfied" percentage, and we've likewise combined the "dissatisfied" and "very dissatisfied" responses into a single "dissatisfied" percentage. To see the full percentage breakdowns, hover over the bars in the "Mobile data services: Overall user satisfaction" chart below. No one likes to publicly tout how much they love their service provider and its data network, but we found that overall people are extremely satisfied with them. 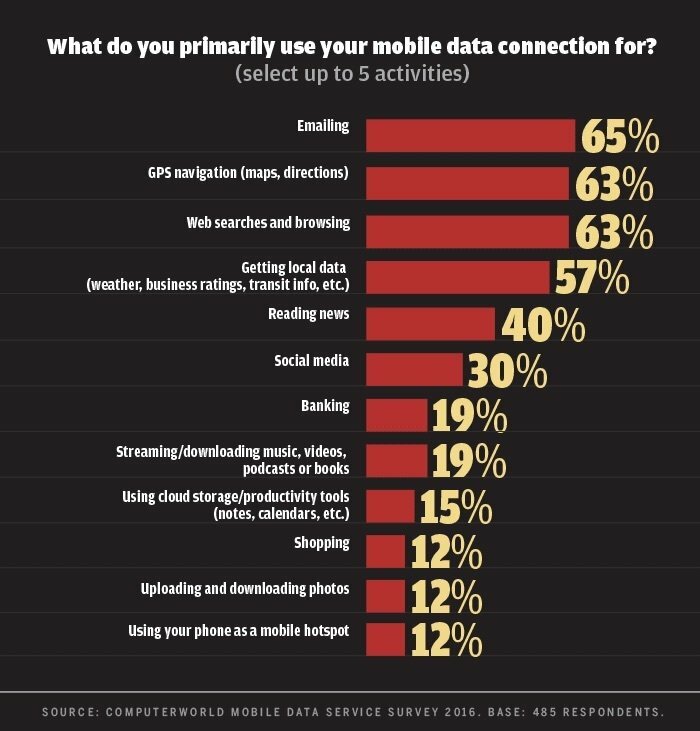 For example, 79% of 2016 respondents are satisfied with the availability of their data connection, up from 70% in 2015 and 62% in 2014. That’s a sign that providers are responding to consumer demand, rather than taking their customers for granted, at least when it comes to data networks. 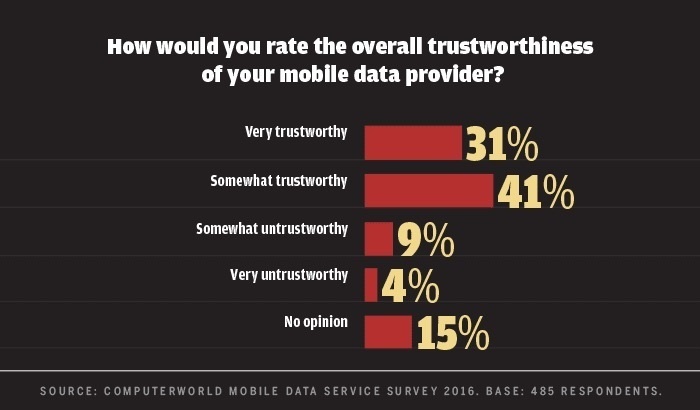 Source: Computerworld mobile data service survey 2016. Base: 485 respondents. Smartphones are used more for data than they are for phone calls, and so data network coverage and availability could be the most important feature offered by a wireless carrier. So, we asked people how satisfied they are with their network coverage. They’re a happy lot. 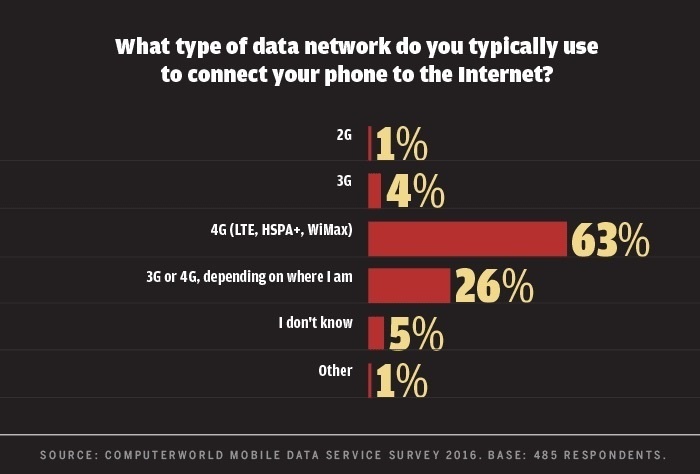 Overall, respondents are extremely satisfied with the availability of their data connection (is the connection there when and where they want it? ), with 79% satisfied and only 7% dissatisfied. People are more satisfied with the availability of their data connection than they were when we surveyed them in 2015, when 70% were satisfied and 14% were dissatisfied. And they’re much happier than they were in 2014, when 62% were satisfied and 20% were dissatisfied. Just like last year, Verizon has extremely high satisfaction ratings here, a whopping 87%, up from 81% last year. T-Mobile comes in second, with a 78% rating, well up from its 59% a year ago. AT&T is in third this year with 73% (up from 66% last year), and Sprint comes in fourth, with 69%. But that 69% is a victory of sorts for Sprint, because a year ago its customers were not a happy bunch, with only 48% satisfied and 34% dissatisfied with the availability of their connection. People are nearly as happy with the reliability of the data connection once it's made (are there dropped connections or streaming interruptions? ), with 75% satisfied and 9% dissatisfied. That’s a big jump over 2015 when 65% were satisfied and 14% dissatisfied, and in 2014, when 56% reported themselves as being satisfied and 20% dissatisfied. As with last year, Verizon is the 2016 winner, with 82% satisfied, followed by T-Mobile with 75% satisfied, Sprint with 72% satisfied, and then AT&T with 67% satisfied. Once again, Sprint may be the happiest of all this year, because its numbers are up dramatically compared to a year ago, when only 46% were satisfied and 33% dissatisfied. Making and keeping a connection is one thing, but the actual speed of the connection is another entirely. So, we asked how satisfied people are with how fast their data is uploaded and downloaded. Turns out they are not as pleased with their network speed as they are with the availability and reliability of their connections. In fact, there’s little change from last year. This year, 71% of survey respondents say they are satisfied with their download speed and 10% dissatisfied, essentially unchanged from a year ago. Verizon is the winner in this category as well, with 77% satisfied, followed by T-Mobile with 73% satisfied, Sprint with 69% satisfied, and AT&T with 65% satisfied. T-Mobile won’t be happy with these numbers: Last year it was the leader with 83% of its customers satisfied with download speeds. As with a year ago, people aren’t as pleased with their upload speeds as with downloads. Sixty-five percent are satisfied and 9% dissatisfied, little changed from last year, when 62% were satisfied and 9% dissatisfied. T-Mobile, Sprint and Verizon are essentially tied in this category, with T-Mobile getting a 70% satisfaction rate and Sprint and Verizon each getting 69%. AT&T lags well behind, with only 58% of customers satisfied with upload speeds. That’s barely up from 53% a year ago. As for Sprint, it once again will be happy with its numbers this year, because a year ago, a mere 51% of its customers were satisfied with upload speeds. People aren’t much happier with the overall value they get from their mobile service provider — that is, their service's performance relative to its cost — than they were last year. Fifty-eight percent are satisfied, and 19% are dissatisfied. A year ago, 55% were satisfied and 24% dissatisfied. As with a year ago, T-Mobile is clearly the value leader. It has a 71% satisfaction rating value. (Last year it had a 77% rating.) Next is Sprint with 64%, Verizon with 50% and AT&T with 47%. More people than not are satisfied with their carrier's technical support this year — 59% are satisfied and only 8% dissatisfied. That continues a gradual upward trend: In 2014 only 48% were satisfied, and 54% were satisfied in 2015. For the fourth year in a row, T-Mobile wins this category: Seventy-one percent of its customers who took our survey report themselves as satisfied. Verizon has a 61% satisfaction rate, followed by AT&T with 58% and Sprint with 56%. People are pretty satisfied with their carrier's customer service and billing, with 62% satisfied and 12% dissatisfied, the exact same percentages as last year. T-Mobile wins here as well, with 70% of its customers satisfied. That's followed by Verizon with 61%, AT&T with 57% and Sprint with 54%. Mobile providers have a tremendous amount of information about people’s lives, including their locations, contacts, websites they visit, apps they use, and much more. While privacy advocates worry about that, our survey found that users don’t. As in our 2015 survey, most people trust their carrier to properly handle their private data and don’t believe their carrier engages in deceptive business practices. The trend here is positive: This year 72% of respondents rate their carrier as trustworthy, while 13% rate their carrier as untrustworthy and 15% say they have no opinion. Last year, 69% rated carriers as trustworthy versus 16% untrustworthy, and in 2014, 63% of respondents rated their carriers as trustworthy and 22% considered them untrustworthy. Even though people rate providers highly for privacy issues, 46% of respondents are more worried now about the privacy of their mobile data than they were a year earlier. (Five percent are less worried and 49% have the same level of concern.) Despite these fears, only 3% say their phone has ever been compromised or hacked. Not much more than a third of respondents (38%) say they have changed how they use mobile apps or mobile data in the past year because of privacy concerns, while the remaining 62% say they haven't changed their mobile behavior because of privacy fears. Those who have made changes cite a variety of safety measures, including avoiding untrusted apps and websites (75%); using fingerprint unlock, stronger passcodes or two-factor authentication (73%); avoiding public Wi-Fi (65%); and restricting app permissions including access to location (63%). Nearly two years ago, in February 2015, regulations went into effect that required carriers to allow customers to unlock their phones if they want to switch carriers. And as long-term contracts fall out of favor, more consumers are buying unsubsidized, unlocked phones that aren't tied to a carrier's contract. So we asked whether people unlock their phones or buy unlocked phones. The answer is a resounding no: Only 9% of respondents have unlocked their smartphones this year, and only 20% have bought a new unlocked phone. Each year prognosticators say that in-store purchases made from smartphones using payment services such as Apple Pay, Android Pay, Google Wallet, PayPal and Samsung Pay will finally hit the big time. So we wanted to see if 2016 would finally be the year mobile payments took off. It wasn’t. Only 25% of our respondents report making even a single in-store mobile payment. And things don’t look different for next year, because a mere 19% of respondents who haven't tried in-store mobile purchases yet say they plan to do so. How do you use your mobile data? Is your connection good enough for watching videos – and do you often watch them? Do you connect using 4G or 3G networks? We asked these questions and more in our 2016 survey. We wondered how much time people spend online with their phones versus other devices, and we found that laptop and desktop computers still rule. 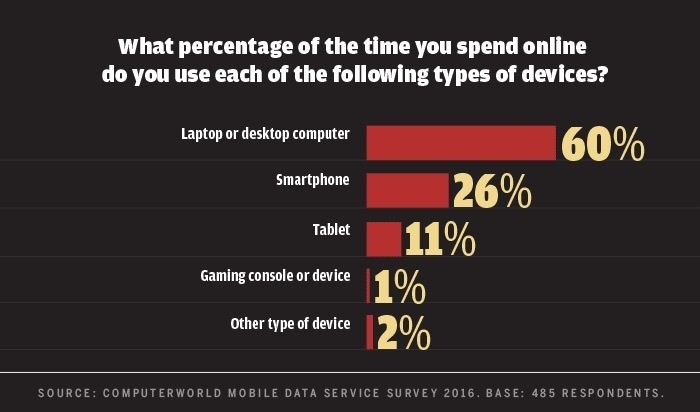 Respondents cumulatively spend 60% of their time online with laptops and desktops, 26% of the time on smartphones and 11% of the time on tablets, with the remaining 3% split between gaming consoles and other devices, notably smart TVs and media-streaming devices such as Apple TV, Chromecast and Roku. When people are using their phones online, 4G networks are the norm, continuing a trend we’ve seen in our last several surveys. Sixty-three percent of respondents connect solely via a 4G connection; 26% connect via 4G or 3G, depending on where they are; and only 4% connect solely on 3G. That compares to 60% connecting solely via 4G in 2015, and 55% in 2014. With all-you-can-eat data plans no longer dominant, people are careful how long they use their data connections. 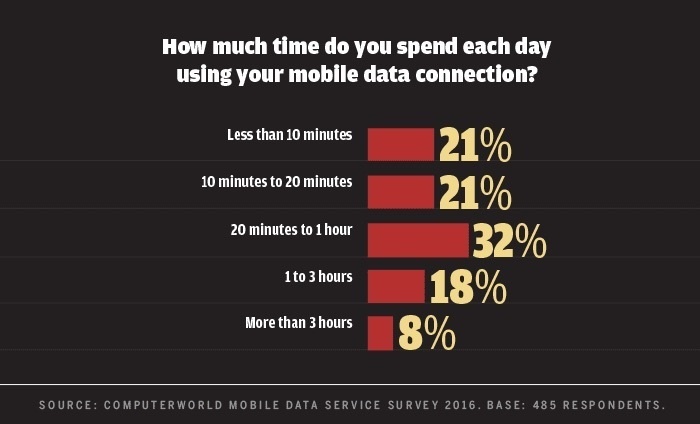 Only 20% of respondents say they use their data connection for more than an hour a day, 32% use it for between 20 minutes and an hour, 21% use it for between 10 and 20 minutes, and 21% use it for less than 10 minutes. (These numbers don't include the amount of time they use Wi-Fi connections.) These percentages are almost precisely what we found last year. Thirty-five percent of respondents report using their phones more for business in 2016 than in 2015, for activities such as checking work email, using productivity apps and accessing data in the cloud. Only 12% say they're using their phones less for work. The rest say business use is unchanged. Only 19% of respondents who use their personal smartphone for work are fully or partially compensated for their phone expenses by their employer, and only 34% say their employer has a formal policy regarding the use of smartphones at work. What do you use your data connection for? Four activities are cited by more than half of respondents: emailing by 65%; web searches and browsing by 63%; GPS navigation and maps by 63%; and getting local data such as weather, business hours and transit info by 57%. Only two other activities reach the 30% mark: reading news with 40% and using social media with 30%. Only 22% of people are watching more videos than a year ago, and 13% are watching fewer, with 65% saying their video-watching has stayed the same. And only 19% of respondents say they are using their mobile data connection to stream or download video, music, podcasts or books. Percentages do not add up to 100% because of rounding. 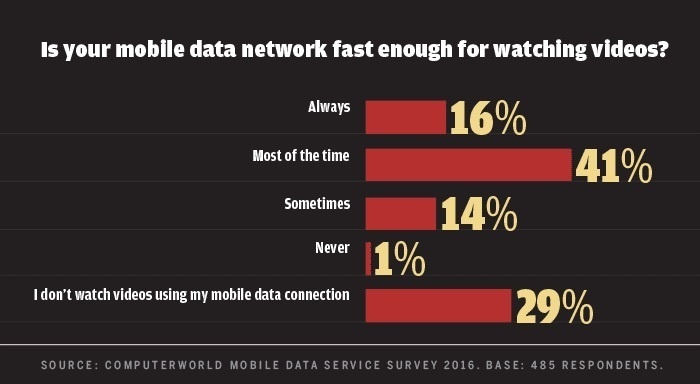 Still, when they watch, they get reasonable data connections: 16% of respondents say their mobile network is always fast enough for watching video, 41% say it's fast enough most of the time, and 14% say it's sometimes fast enough. One percent say it's never fast enough. That’s down from last year, when 24% of respondents said their mobile network was always fast enough, 58% said it was fast enough most of the time, and 18% said it was sometimes fast enough.